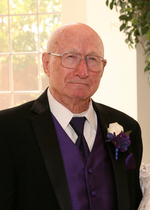 Bud Bobbitt, age 87, entered the Gates of Heaven on Thursday, February 7, 2019. He was born in Perryton, Texas to Felix Monroe and Myrtle Kathryn (Carpenter) Bobbitt on Monday, June 1, 1931. Bud was reunited with Virginia, the love of his life, and wife of 59 years on her birthday, giving her a gift of their reunited love and togetherness for her special day. He will lovingly be remembered for his great work ethic, kindness, strong will and generous spirit. Bud was an Air Force Veteran and Naval Academy Midshipman, serving between 1950 through 1952 during the Korean conflict, until being medically released. He was a resident of Clayton, New Mexico for 18 years. Bud then began working as a clerk typist for Amarillo-Borger Express in Amarillo, Texas where he stayed for 10 years. He left Amarillo and moved to Abilene, Texas where he began his career as an accountant working for Merchants Fast Motor Lines, staying there for approximately another 10 years. In 1974, Bud founded and later became Chairman of the Board of Topline Warehouse, which in the beginning was located in Dallas, Texas, but then he moved the business to the old Post Office building located in Grand Prairie, Texas, where it continues to this day. He is preceded in death by his parents, 3 sisters, 1 brother and wife Virginia (Callaway) Bobbitt. Left to cherish his memory are son Mark D. Bobbitt; daughter Robyn A. Salmi; daughter Jeni F. Cobb and husband Steve; grandson Brian B. Bobbitt; grandson Steven L. Bobbitt and wife Olga; grandson Timothy M. Bobbitt; grandson Taz D. Salmi and wife Kaylee; granddaughter Lexi T. Salmi; sister Lynda Freeman; brother Johnny Freeman along with numerous extended family and loving friends. Forever in our hearts and minds, until we see you again Papa. A memorial service with Military Honors will be held 10:00 am, Wednesday, February 20, 2019 at the First Baptist Church, 950 Mayfield Rd. in Grand Prairie, Texas 75052. In Lieu of flowers the family requests memorial donations to Dementia Alliance International, in Bud’s honor. This obituary is protected by copyright by Browns Memorial Funeral Home. Proudly Serving the Communities of Irving, Grand Prairie, Euless, Bedford, Las Colinas, Dallas, Ft. Worth, DFW, Colleyville, Grapevine, Mid-cities, Metroplex, Dallas Fort Worth, Carrollton, and Farmers Branch Browns Memorial Funeral Home is located in the state of Texas, United States.